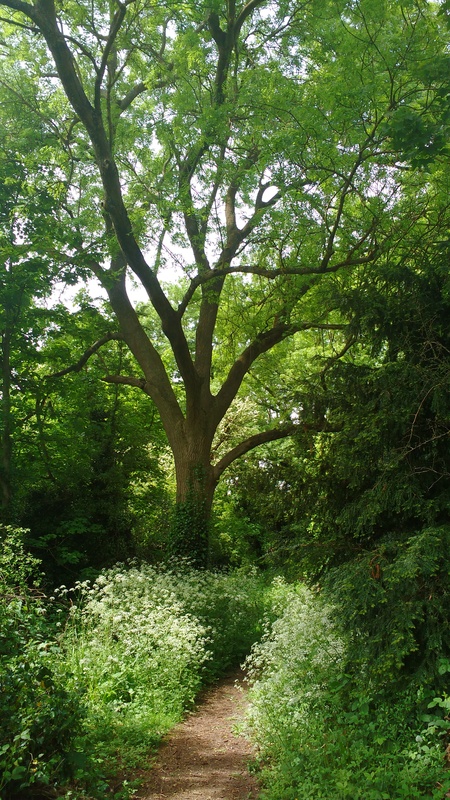 Queen Mary’s Woodland is a 6ha area of semi-natural secondary woodland and a Site of Importance for Nature Conservation (Borough Grade 1) and as such a significant area of woodland in Sutton. The woodland lies over upper chalk, and has a gently sloping topography to the south and east towards the valley slopes of Carshalton Beeches area. The main woodland entrance is located off the Diamond Jubilee Way and Damson Way roundabout. There is a hard surface path that loops around the interior of the the woodland with rustic benches for easy access to enjoy the woodland. Nineteenth century Ordnance Survey maps show that most of what now comprises Queen Mary’s Woodland was then occupied by open fields, presumably grazed downland. Part of the woodland known as Wellfield Plantation has an older land use presumably for timber growing. In the early 20th century, the site was part of the extensive grounds of the former Queen Mary’s Hospital during which time cedar Cedrus sp. and beech Fagus sylvatica were planted and are now mature trees. Queen Mary’s Woodland represents a natural colonisation of what would have most chalk downland. This has been an unmanaged process over perhaps a hundred years or more until very recently, apart that is from the eastern area which was more formerly managed as parkland. Queen Mary’s Woodland was transferred to the London Borough of Sutton under a Section 106 agreement in 2012, as part of a new residential development in the local area. This agreement also funded a programme of habitat and infrastructure improvements aimed at increasing the woodland’s value for wildlife, and offer the local community a opportunity to volunteer on practical woodland tasks and enjoy woodland nature on the doorstep. The woodland is predominantly recent secondary, mixed broadleaved, semi – natural woodland. Mature trees are mostly ash Fraxinus excelsior and sycamore Acer pseudoplatinus with some wild cherry Prunus avium. A few mature pendunculate oak Quercus robur can be found around the eastern open woodland area, together with the many large cedars, pines and beech trees. Ivy Hedera helix is abundant throughout the mature canopy. Some areas of the woodland is at a post thicket stage of development of predominantly sycamore and mature hawthorn Crataegus monogyna, with occasional ash and cherry. The woodland understory (shrub layer 2-5m) consists of frequent hawthorn and sycamore with occasional hazel Corylus avellana, elder Sambucus nigra, ash, holly Ilex aquifolium, Cherry plum Prunus cerasifera, spindle Euonymous europaeus, wild privet Ligustrum vulgare and purging buckthorn Rhamnus catharticus. Recent new planting has increased the spread and diversity of shrubs and trees across Queen Mary’s Woodland especially along cleared areas, path side and around the entrances to the woodland. Species included in the new planting are hazel, purging buckthorn (food plant for the brimstone butterfly Gonepteryx rhamni), goat willow Salix caprea, and crab apple Malus sylvestris, field maple, sweet chestnut Castanea sativa and pedunculate oak, with a few wild pear Pyrus communis and small leaved lime Tilia cordata, among others. Hazel has received the most planting along paths and density (2-3m spacing) in two new future coppice areas to replace dense sycamore stands, which have been felled and cleared. The storm damage of 1987 resulted in several fallen large middle aged/mature trees and reduced a significant proportion of sycamore mature canopy cover. Many of these are continuing their growth from their prostrate position. The field layer vegetation away from the paths has a low diversity and often dominated by ivy with occasional thickets of bramble Rubus fruticosus agg., cow parsley Anthriscus sylvestris and nettle Urtica dioica. Patches of gooseberry Ribes uva-crispum also occur frequently across the site. Elsewhere are a few scattered patches of dog’s mercury Mercurialis perennis, lords and ladies Arum maculatum, hedge woundwort Stachys sylvatica, ramsons Allium ursinum and sweet violet Viola odorata. 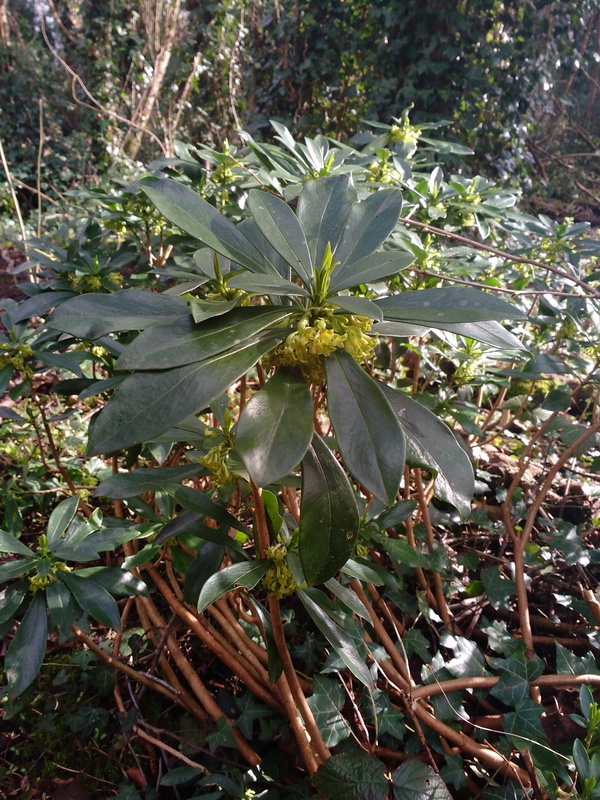 Spurge laurel Daphne laureola is a notable plant which is associated with open woodlands on chalk (especially beech) and is slowly spreading. Recent habitat work has introduced a wider range of chalk grassland and woodland species such as ox-eye daisy Leucanthemum vulgare, Salad burnet Poterium sanguisorba, greater knapweed Centaurea scabiosa and greater stitchwort Stellaria holostea to areas where we have undertaken work to remove invasive species. A woodland pond was created in 2016 and has established well, with varied vegetation including: water plantain Alisma- plantago aquatica, arrowhead Saggitaria sagitifolia, common rush Juncus effusus, brooklime Veronica beccabunga, curled pondweed Potamogeton cristatus, spiked water milfoil Myriophyllum spicatum and frogbit Hydrocahrus morsus-ranae. Dragonflies such as the emperor Anax emperator and common darter Sympetrum striolatum have been observed to be egg laying in the pond. Amphibians present and likely to breed include common toad Bufu Bufo and common frog Rana temporaria and smooth newts Lissotriton vulgaris. Recording of Fungi species has begun with approximately 30 species recorded to date. 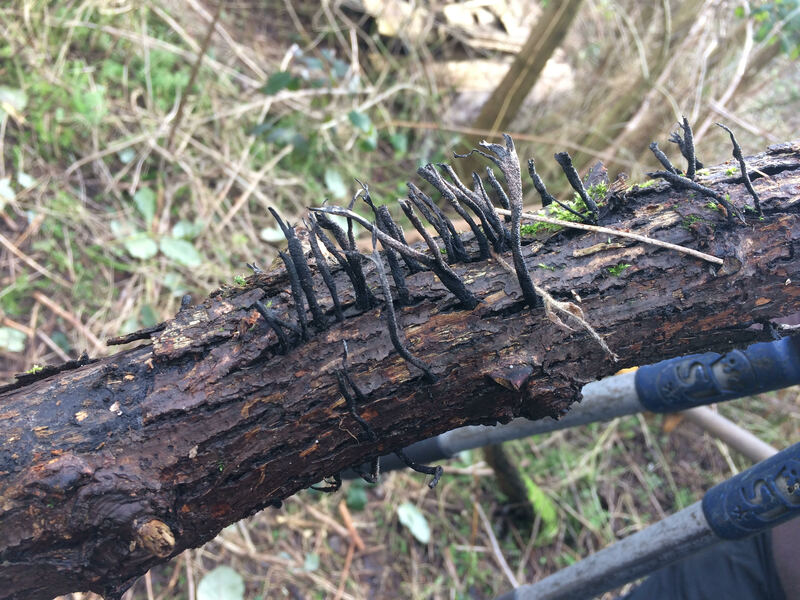 Fungi are most frequent and noticeable on decaying logs and twigs on the woodland floor such as candlesnuff fungus Xylaria hypoxylon and jelly ear Auricula auricula-judae. The bryophyte feature of interest is the epiphyte assemblages. The most unusual moss recorded at the site is slender bristle-moss Orthotrichum tenellem. This has only been recorded in a few locations in Surrey and could be said to be rare in Surrey. The greatest variety of epiphytes was found on a collection of elder shrubs. These epiphytes, with the exception of white-tipped bristle-moss Orthotrichum diaphanum, were very rare in the South East until twenty years ago. Over the last twenty years they have been become more common but are still of note and indication of better quality and older woodland. Lepidoptera are represented by several of the more common open countryside species, with the strong flight of the yellow leaf shaped winged brimstone butterfly being the earliest to be seen on a sunny March day. Other species include orange tip Anthocharis cardamines, speckled wood Parage aegeria, comma Polygonia c-album and holly blue Celastrina argiolus have been observed. These are commonly seen across the woodland, particularly along the more open grassland and glade areas. Mammals include wood mouse Apodemus sylvaticus, common shrew Sorex aranaeus, field vole Microtus agrestis, fox Vulpes vulpes and one or two roe deer Capreolus capreolus. An early evening stroll might encounter bats such as common pipistrelle Pipistrellus pipistrellus and soprano pipistrelle Pipistrellus pygmaeus. Until autumn 2015 the woodland (including Wellfield Plantation) had received minimal management, resulting in very little open space (< 2%) with a dominance of heavier shade conditions, except around the relatively more open eastern side. However the eastern side was dominated by the non native invasive cherry laurel Prunus laurocerasus, which caste dense shade at ground level. This plant has been subsequently controlled on site through cutting and stump removal. Habitat management from 2016 onwards, has concentrated on diversifying the woodland’s structure and assemblage of habitats. This work has included significant removal of existing low value vegetation and tree felling (predominantly sycamore) to create the foundation for new sunny glades, pathways and woodland edge zone, as well as new meadows, hedgerows and a pond. 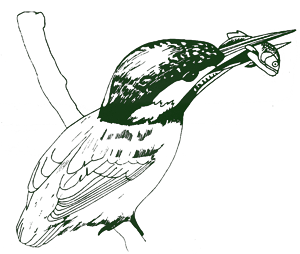 Increased provision of decaying wood habitat has also been a priority. Significant areas have been planted with seed mixes and pre-grown trees, shrubs and wildflowers suitable to the locality. The design aim that has guided all the habitat creation work has been to establish a high degree of naturalness of vegetation and habitat typical of a well managed lowland woodland. Future management will aim to maintain and further improve the habitat diversity to offer as wide a range of ecological niche opportunities possible for flora and fauna. Perhaps one day a white admiral butterfly will be seen gracing the sheltered glades of the woodland.